This product is a tiny clip-on detachable lens for mobile phones. It is universal for iphone/HTC/Sumsung and so on. It is also applicable for iPad/Tablet PC/Laptops or anywhere you can image. There are two lens available, including fish eye and macro lens. Macro lens can take clear photos of small objects; fish eye lens can capture a scene which looks like fish visual field. Using those lenses, you can fine and enjoy the instant beauty of the world. 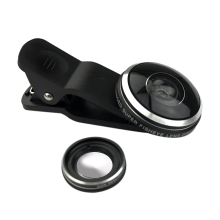 2 in 1 mobile phone lens, including fish eye and macro lens. Universal and applicable to mobile phone. Mini, portable and detachable; convenient for you to bring anywhere and anytime. Provide you a different visual field and unusual beauty of the world. Suitable as a little gift to friend or family member.